You might say I like rocks. I collect them, display them, write on them, and play with them. I also use them in counseling. 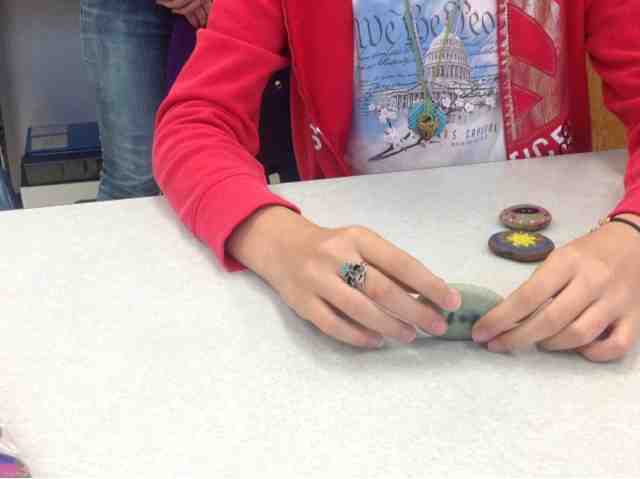 In my last post, I used them to make a connection with students, how rocks are like people. Today, I used them more like Rory's Story Cubes, and we told stories with them. The 8th graders wanted to eat lunch with me today because tomorrow, our usually day for Lunch Bunch, they would be on the 8th Grade trip to New York City. Start your story with "During my trip to NYC. . ."
Below you will find a close up of several of the Rocks. They are easy to make. 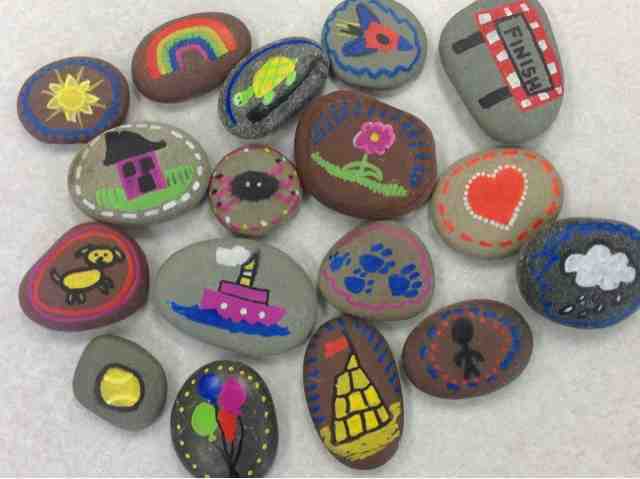 Just find some nice flat rocks and draw pictures on them using paint pens. I used Sharpie Paint pens they are inexpensive, can last for years, and mark on just about anything. Counseling materials don't have to cost a lot of money to be effective. You just need to use them effectively. 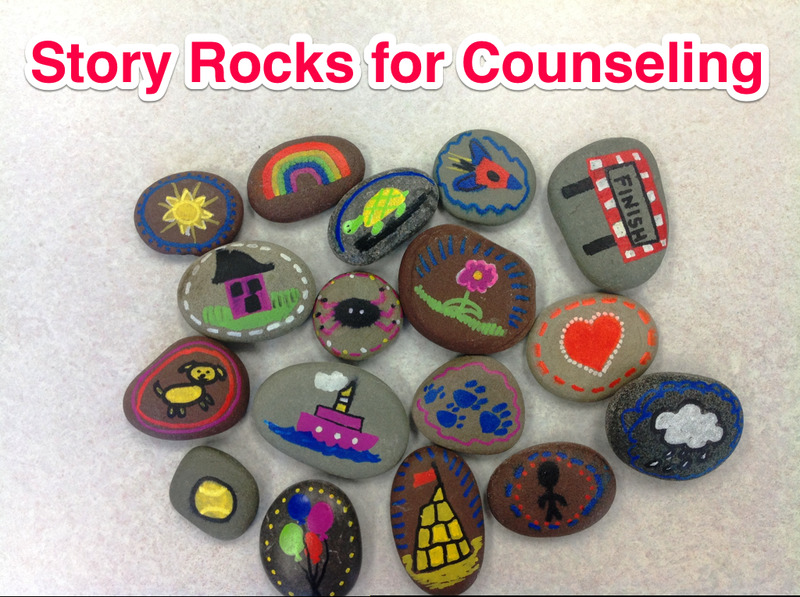 Do you have another use for rocks in counseling? Let me know. I still have a lot of rocks left over waiting to be put to use. . . I'm glad you like it. Thanks for visiting my blog. Thanks Gail! The kids really love them too. 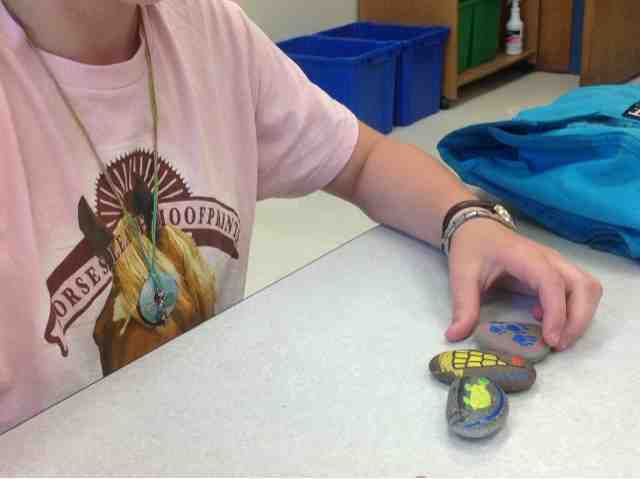 You can make 'U' rocks for a self esteem group. I recently did something with clear floral decorating stones with colored paper glued on. I wrote "I CAN B+" on the paper and gave them to the students in a stress lesson I gave. We talked about how their self speak tends to get more negative the more stressed they are. So, hopefully they'll B+ next time!